Some Bitcoin slot players are just lucky enough to hit a big payload once in a lifetime, while others are even luckier and get to cash in a big paycheck twice in a single year. One of the latter is an unnamed BitStarz player who was able to hit a new slot jackpot only months after receiving a big payload from the popular Bitcoin casino. It just goes to show that luck isn’t a one-time thing. The monumental win was revealed in a public press release by BitStarz Casino, where it was said that the unidentified lucky player hit a jackpot of $48.374, or 10 BTC, while playing a single slot game at the casino. 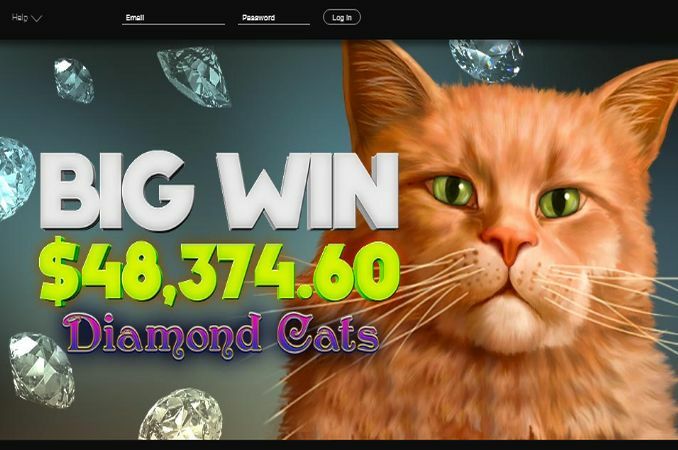 The slot game in question was Amatic’s Diamond Cats – a 5-reel, 20-payline slot that’s filled with glittery animations and symbols of luxurious cat breeds. But what’s even more unusual than the choice of game was that s/he was able to hit the jackpot only three months after already collecting a $64,818 cashout from playing a different BitStarz slot. Namely, as we reported back in July, the first win was hit on the Hansel and Gretel: Witch Hunters slot from BetSoft, based on the Hollywood film with the same name. At the time, the player in question was able to trigger the prize with a single spin, making his win sound just as unimaginable as the film’s story was. His current win, however, was triggered with a 1,000x multiplier in a single session on the glitzy slot game. As the casino says, the player now has enough money to “feed a cat for 503 years”. Srdjan Kapor, the marketing manager at BitStarz Casino, commented on the winning by saying that: “some people might think that just because you’ve won in the past, it means you can’t win again. Well, this is clear proof that it isn’t true.” He also congratulated the winner for his second lucky win and shared his enthusiasm of seeing whether the same player can score yet another big win soon. If you’re looking to have as many playing options as you can in a Bitcoin Casino, BitStarz Casino is the place to be. Apart from offering Amatic and BetSoft games, this casino also features games from other big names in the industry, including popular slot developers Microgaming and NetEnt as well as SoftSwiss, Endorphina, and live dealer game providers Ezugi. With over 850 different games to choose from, BitStarz provides enough variety to never let you get bored. One of the well-known facts about this casino was that it was one of the first online gaming platforms to offer wagering in Bitcoin + other fiat currencies. BitStarz Casino also has provably fair games to offer and, more importantly, an instant processing time for Bitcoin withdrawals with an average payout time of only 10 minutes. If you’re interested in checking out the offer, or trying one of the lucky slot games for your chance of hitting the mother lode, you can give BitStarz a visit via this link.